It all started a few weeks ago, while wandering my favorite antique shop. 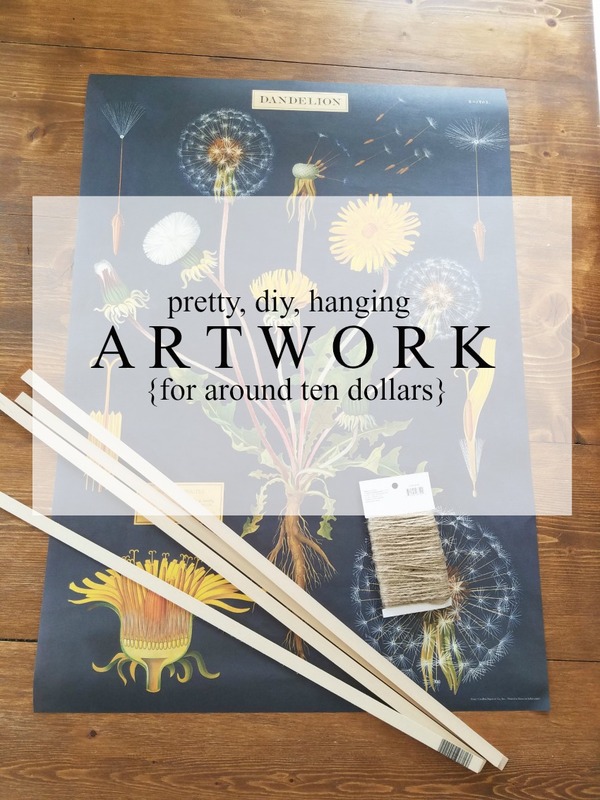 They had a huge basket with rolled up poster prints and I spied the dandelion one. Dandelions will always make me think of my mama. She LOVES them. 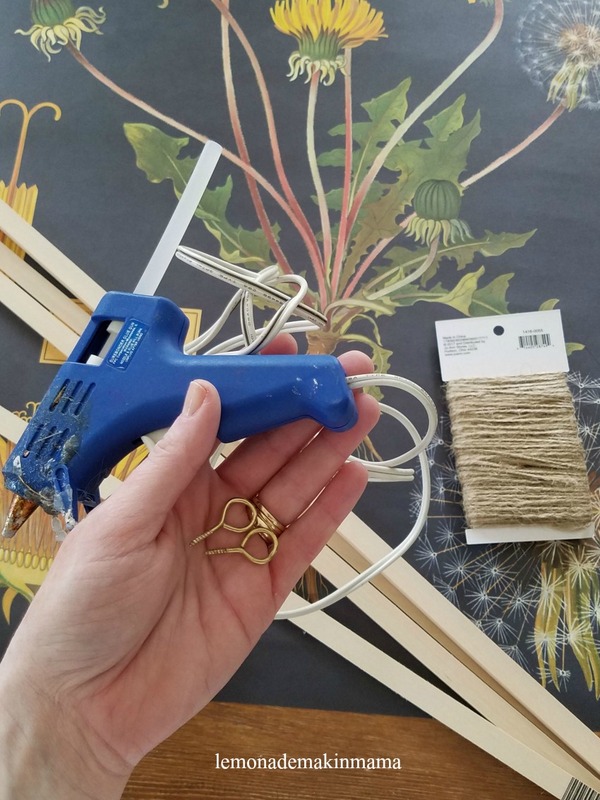 (And yes, this could be, because we used to pick all the dandelions from the yard and proudly bring them inside as though they were the best roses and she was a queen.) She always put them into pretty vases and thanked us profusely. Now, my brother and I are adults and she still professes a love for these cheery golden weed/flowers. Regardless, I loved this print and it kind of gave me heart flutters. I especially loved the price, at five dollars. I went back a couple of weeks later after thinking about where I might like to hang it and claimed my copy. 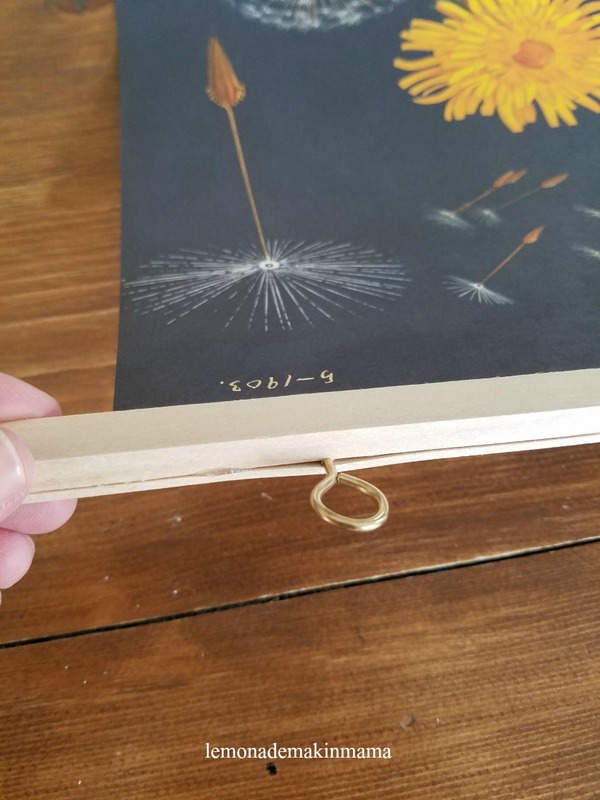 Once hung, it makes a really fun and inexpensive art that can be changed out easily. Can you think of any rooms or spaces in your home, where a project like this might be a welcome addition? Isn't it fun updating your home on a dime? Anyway, moving on to adult sized kids... The laundry room had become a dumping ground as of late. Once painted, I refused to let them use it for shoe storage and pushed everyone back to using the hallway system. As an organized person, I'm working to teach my kids that if they have more than two pairs of shoes here, it's probably time for a quick trip to closets with the extras anyway. This habit will help them manage their own households one day, which is really the entire point. I find that if I give them extra space for more shoes, they take it, so logically, giving them less space means less shoes. Guess what? This actually works, with only a tiny bit of gentle re-training on the subject. Once I reminded them that the Ikea shoe storage cubby was where our shoes were going from now on, I noticed that shoes started being stored back in there, and extras were getting put away. Yipee! Most organization comes from Mama training and saying, "Oh, could you do this instead please?" anyway, right alongside keeping "things" at a manageable amount. It's up to use to lead the charge and keep home a haven. One thing my boys were doing that was driving me a bit bonkers, was bringing shoes into the kitchen to put on so they could sit down. Sometimes a certain teen boy who runs... was also bringing in mud chunks and track turf so I evaluated the entry way and decided it needed some tweaking. I ran out and hunted for an inexpensive thrifted chair and brought home this beauty, above. (You can see the before at the bottom of this post... I painted it with leftover dark gray chalk paint from the laundry floor project.) It has been such a huge hit, that I'm not sure why didn't add a place for them to sit years ago. This overhead cubby system was a great purchase several years ago and the slide-out baskets work well for the hidden storage of small cluttery-type things like hats, sunscreen, gloves and such. I use a chalk label tag (I believe I found a pack of three at Michaels, years ago) and tied them on with string. They are easy to quickly change for seasons. *This cubby system was purchased years ago on Amazon, here. These Ikea shoe drawers tip out and believe it or not, they hold two pairs of men's size 12-13 shoes! Since I have two of those men-sized shoe wearers in this house, it was a great find. Here is the thrifted chair, before... 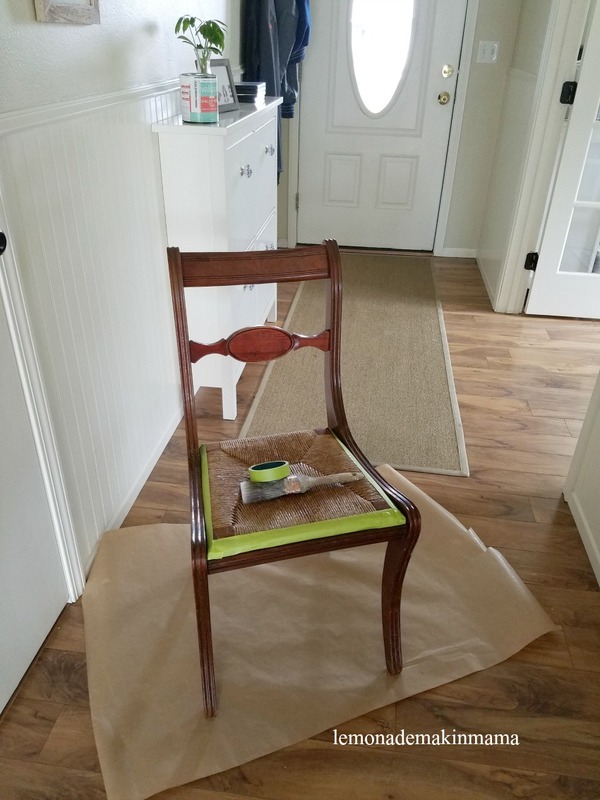 I painted it using my leftover, Valspar chalky finish paint in "Opera gown" and really loved how the feminine lines of the chair paired with the masculine color of the paint. At first I tried white and it was just too "sweet." Now our entry way is the whole package... a pretty and functional spot for all. Especially the boys. And mama's happy because it's tidy and streamlined... you know what they say. If mama's happy..... (wink... true!) 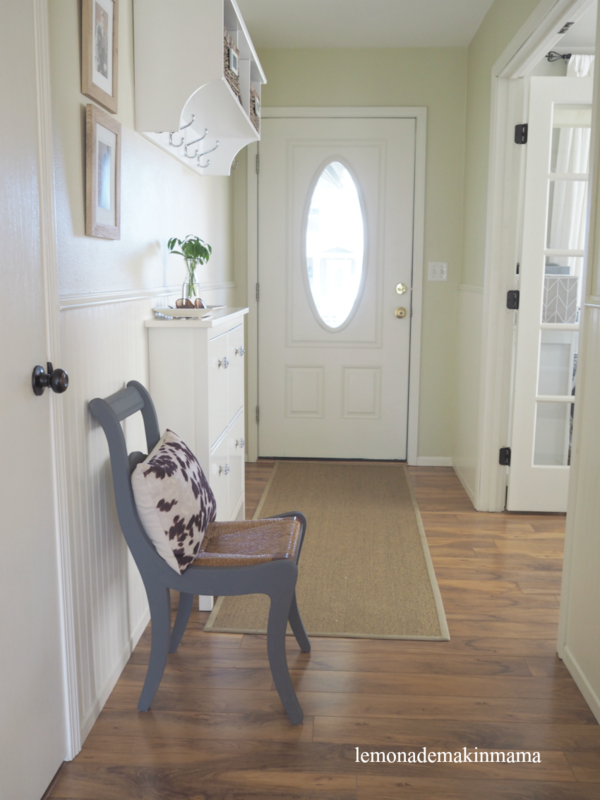 Do you have a great entry way that functions well for your family or is yours in need of a few tweaks? What have you found to work the best for your family's needs? I'd love to hear from you in comments. I'm just showcasing some sweet spots and little tweaks I'm loving, in case you needed any spring inspiration for creating a soothing color palette within your home. Our small space is fairly open concept, and a designer once advised me to keep the colors all fairly similar with nothing too jarring. I've followed that advice for years and the result has always been quite pleasing. I am pretty proud that I grew a tiny, baby plant from the big giant one I have somehow been keeping alive. All I did was clip some foliage and left it in a vase with water until they sprouted little roots... then I potted them! Another faux plant sprig, "potted" in some rocks I had in the garage. It's a lovely- no-kill option for the poor lighting in this office space. Well as you can see, I really do love this color palette. What colors speak to you? I think once you know, you can build your home décor around them and create a restful haven for yourself and your loved ones, quite easily. I got asked a great question on my previous post, and thought it would be a lovely mini post topic, while we're on the subject of downsizing wardrobes. The question, was asked by Shannon. She writes, "What do you clean house/work in the year/do projects in? All I can imagine is a 50's housewife out in her peddle pushers & pearls but know that's not really the case. 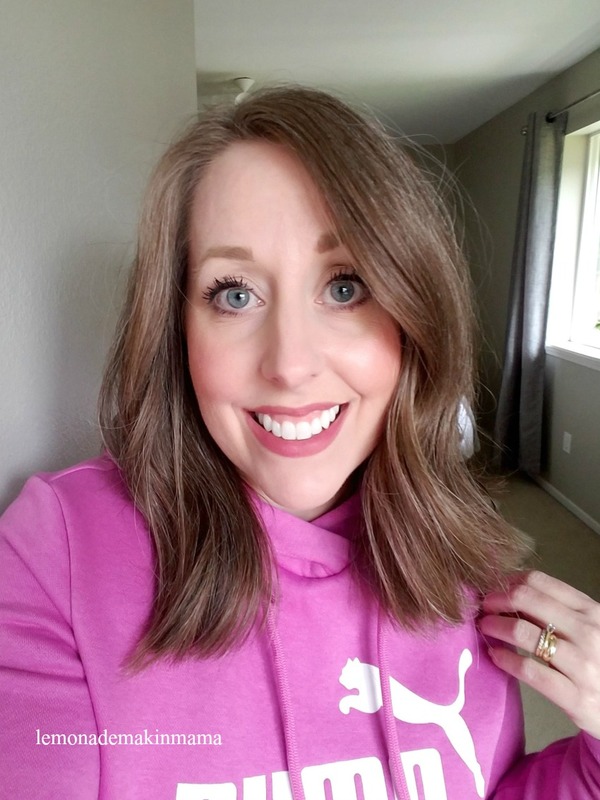 I feel like I can manage a smaller "nice" wardrobe but the bulk of my SAHM day demands things less...structured for lack of a better word....how have you approached this?" 3) One tip I loved from the Madame Chic books, was apron wearing. I pretty much throw on an apron every evening when making dinner, so as to keep my tops as stain-free as possible. This works really well and I haven't had anything stained or ruined beyond repair at this point, over the past couple of years of doing this. 5) Lastly, remember your basics. Black tees... gray tees... white tees. Things like that are great to pull on when a nice blouse or top won't do. They are year-round items every woman should stock up on and have on hand and so versatile. And also, totally unrelated... I decisively chopped my hair last week. I was losing quite a bit of hair and the ends were all whispy so I cut about four inches right off the bottom in a nice, blunt cut. I am loving this length. It's so much easier to manage! Anyway... I hope you enjoyed this very long post answer to one single question. Happy wardrobe managing! 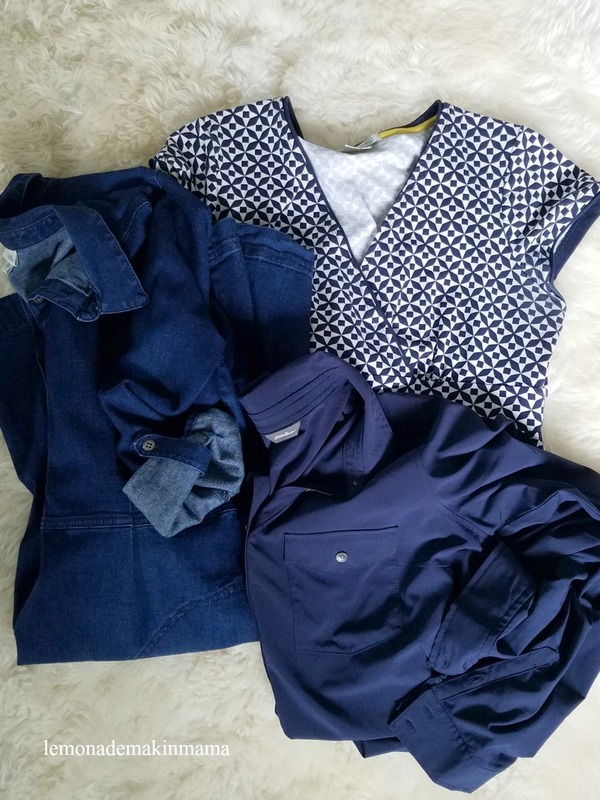 And if you missed my previous post, on my spring wardrobe review, you can click here. Many of you may remember, that I got a hold of the Madame Chic books, by Jennifer L Scott a few years ago. 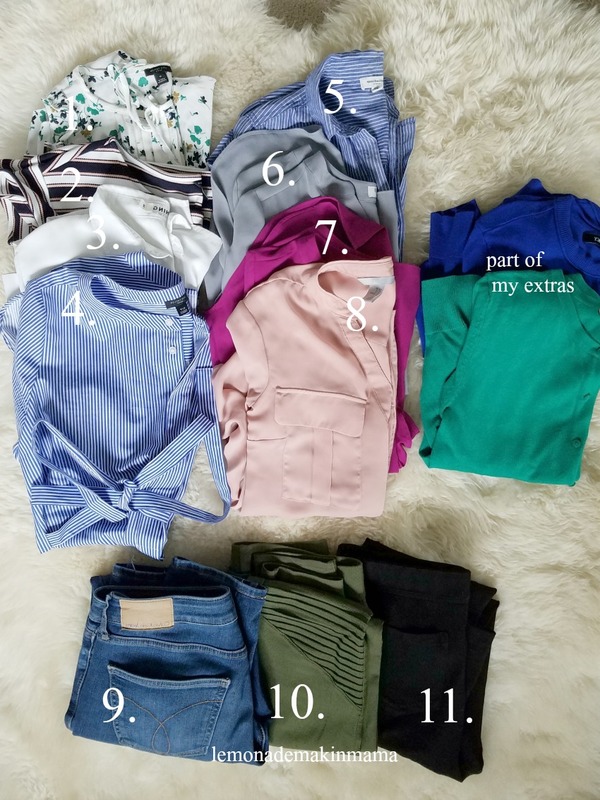 They changed my thinking, and thus my life and now it's all different and wonderful and I'm here to share my spring ten-item wardrobe today. Now if you're just hearing about all this for the first time and going, "Wait... does this girl actually only have ten items of clothing?" You may want to backtrack and read this post from last summer. Navy shirt dress- short sleeves. love that! It changed my life, and that's the truth.